Located in Southern Utah, near the Arizona border, is the Southwest’s best kept secret. The impressive narrows of Buckskin Gulch extend uninterrupted for almost 15 miles and is considered one of the world’s largest slot canyons. Erosion from countless millennia of floods has shaped the characteristic swirls and curves of the sandstone canyon walls, which often soar hundreds of feet above. We offer a variety of tour options based on skill level and interest. Adventure with us on the Buckskin Gulch Trailhead, Wire Pass Trailhead, Middle Route Trailhead, or a combination of the Buckskin Gulch Trailhead and Wire Pass Trailhead! The destination is approximately one and a half hours from Kanab or Page, depending on weather conditions. The Buckskin Gulch Tours departs from Kanab, UT or Page, AZ at approximately 8:00am and returns at various times depending on the trail chosen. A minimum number of guests must be met for The Buckskin Gulch Tours. You may be booked on stand by until the tour is confirmed. Begin your hike in the wash of Buckskin Gulch before you enter into the core of the slot canyon. 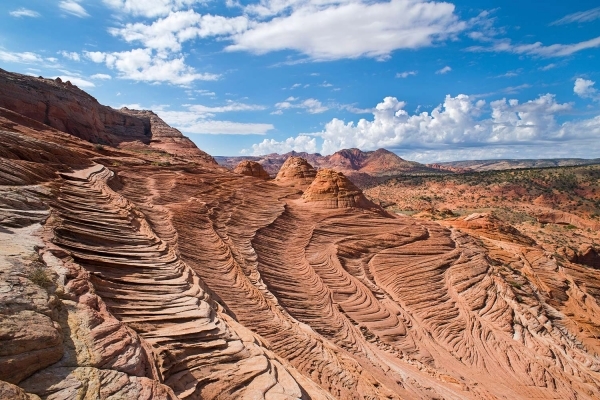 Hike flat ground through towering canyon walls, see petroglyphs from ancient civilizations, and venture out of the wash to see views that rival The Wave and White Pocket. The difficulty of the hike is moderate, but depends on weather conditions. The hike is about 3-4 hours long on flat ground with no shade. It’s perfect for those interested in varied geology with only some time in the slot canyon area. The Buckskin Gulch Trailhead tour departs from Kanab, UT or Page, AZ at approximately 8:00am and returns at approximately 3:00pm. Photo potential of this trail is endless. The lighting turns Buckskin Gulch into the most photogenic of slot canyons, with reflections of warm colors bouncing off the canyon walls. With some obstacles to climb over depending on the flooding of the gulch, Wire Pass is a true photographers trail. The difficulty of the hike is moderate, but depends on weather conditions. The hike is about 3-4 hours long on flat ground. It’s perfect for the non-hiker who wants a true slot canyon experience. Children love this trail due to shade and narrow canyon walls. The Wire Pass Trailhead tours departs from Kanab, UT or Page, AZ at approximately 8:00am and returns at approximately 3:00pm. For those seeking thrilling adventure and incredible Southwest views, take a detour on the Middle Route Trailhead. Climbing down canyon walls to get into the gulch is an requirement, so don’t forget your courage on this trail! See distance landscapes of White Pocket, North Coyote Buttes, South Coyote Buttes and large parts of the Buckskin itself. The difficulty of the hike is moderate, but depends on weather conditions. The hike is about 3-4 hours long with challenging vertical climbs of up to 100 feet and the possibility of deep water and mud. It’s perfect for intermediate or advanced hikers. The Buckskin Gulch tours departs from Kanab, UT or Page, AZ at approximately 8:00am and returns at approximately 3:00pm. Looking for a longer day full of hiking? Combine the Wire Pass Trailhead and the Buckskin Gulch Trailhead in this epic day of slot canyon hiking. You’ll be treated to many types of rock formations such as brain rocks, teepees, waves of multicolored sandstone, lace rocks, and fins. Edmaier’s Secret and The Dive section of Buckskin Gulch are the highlight of this option! The difficulty of the hike is moderate, but depends on weather conditions. The hike is about 7 hours long on flat ground. It’s perfect for those who want to see varied geology and explore as much of the slot canyon as possible. The Buckskin Gulch tours departs from Kanab, UT or Page, AZ at approximately 8:00am and returns at approximately 6:00pm.